How Do You Recycle Windshield Glass? The things that can be recycled grows each year with new and innovative methods including recycled windshield glass. The State of Washington even encourages recycling windshield glass! What Is the Process for Recycled Windshield Glass? According to CWC's Best Practices, processing and or recycling glass from windshields is not all that hard and good for our environment. Because windshields are typically made with two layers of glass along with a PVC membrane between each layer, it used to be difficult to recycle the glass. Now machines are available to recycle glass from windshields through a crushing process. To recycle the glass, the windshield must be manually rolled into a machine that is seventy inches long and fifty inches wide. Once the windshield is fed through this machine, it breaks up the chunks of PVC allowing for easy separation. Surprisingly, the CWC states that, "One pass through one of these systems separates the PVC from the glass windshield and pulverizes the glass into a clean, homogenous product of less than one-quarter inch in size." Imagine the possibilities and products that can be made from this type of recycled glass! What Windshield Glass Used For? Multi-Purpose Bowls - From fish bowls to glass bowls to vases or pitchers, windshield glass makes it possible to reuse this precious commodity. Some of these glass bowls even offer a green hue that is a remainder of the window tint from the original glass. You can also find glass geared toward the wine or beer lover. Look for these on the Internet or on eBay as well as in glassmaker shops. Second Glass in Portland, Oregon offers recycled shower doors, all made from windshield glass. Along with shower doors, Second Glass also makes office dividers, walls, and more! An artist, Ellen Blakely uses recycled glass from windshields to create her beautiful mosaics. You can view Ellen's creations on her website, Mosaic Art Source. Can you walk on recycled windshield glass? EnviroGlas says you can! They offer floor tiles. 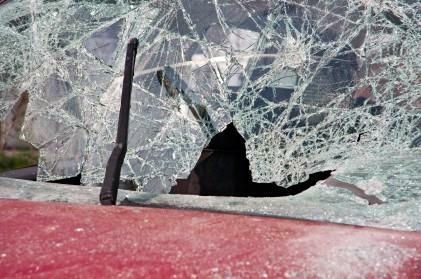 Can You Purchase Recycled Windshield Glass? AutoMotix - This company offers a replacement windshield glass option. You can search their enormous database of used windshields and have them shipped to you or pick them up. Save hundreds on recycled glass for your vehicle at AutoMotix. Aachen Auto - If you live in Michigan, stop by Aachen Auto where they offer deeply discounted prices on used windshield glass. Junkyards and Garage Sales are also great places to find old windshield glass that you can recycle on your own. Visit venues near you and don't forget to negotiate the price! If you want to purchase any type of glass and recycle it, make sure you're knowledgeable and capable to first dismantle and then reuse windshield glass. Visit your local recycling center to get tips on how to recycle your old windshield glass. Take a class at your local community college on glassmaking for great recycling ideas. As we become more aware of the hefty landfills all around us, utilizing recycled windshield glass products is a great way to not only help the environment, but to build something beautiful that can last a lifetime.